Boyd Rice Solicitors are a firm of solicitors based in Newtownards with over 30 years experience representing the people of Newtownards and the surrounding areas. Having successfully resolved thousands of injury claims they have become one of the leading personal injury law firms in Northern Ireland. Boyd Rice Solicitors also offer a number of family services including ancillary relief proceedings, care proceedings, childrens’ orders, divorce proceedings and non-molestation proceedings. Boyd Rice Solicitors also offer conveyancing services, whether you are buying a new home, buying commercial property, remortgaging or selling your home, Boyd Rice Solicitors can help you. 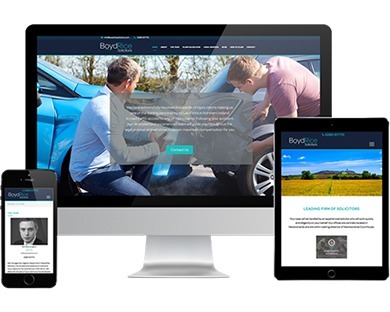 They recently approached us to build a brand new website to promote their services online. With a few cool features such as a claims calculator which allows you to see how much your injury claim would be worth with a visual, interactive representation of the human body.